Castillo Tours is one of the foremost tour guide agencies in Puerto Rico, offering 17 tours from helicopters to kayaks to horses. You must paddle the kayak yourself. You don’t get to fly the helicopter. With the horses, who’s kidding who, the horse is in charge. 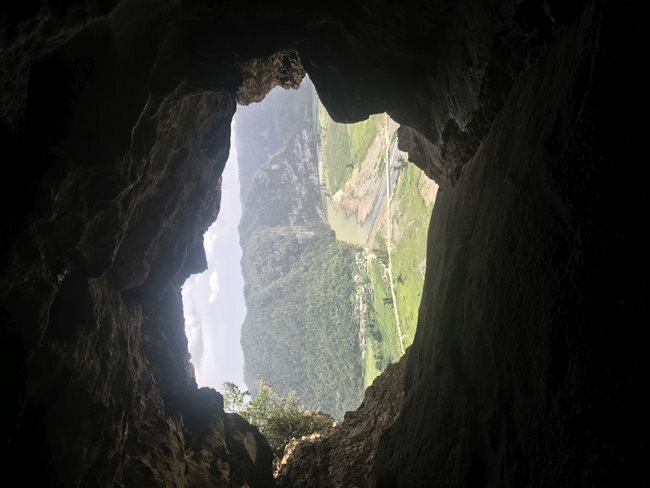 We took a tour to two separate destinations that happen to be nearby each other: “Cueva Ventana”, the Window Cave, and Arecibo Observatory. Fortunately, it was possible to combine these destinations, whereas sometimes on separate days we got ferried from San Juan to the same corner of Puerto Rico twice and I wished we had stayed overnight locally. Our guide, Carlos, kindly picked us up in a van from San Juan, where most tourists are based in Puerto Rico. He didn’t point out landmarks, being a bit quiet at first, but answered questions when we asked. But we had lunch together, and by the end of the day he let his guard down and talked to us without the filter of tourism, like we were real friends, more than any other guide we had that week. The Window Cave is popular because it is so accessible to tourists. You arrive to find a shaded seating area where they sell water, soda, mugs, t-shirts, jewelry, branded bags of coffee, yogurt, and tropical fruit. Then you get a hard hat and are led through the cave itself. Carlos stayed with the van, and our guide was Misael, who was very friendly and made jokes. He said, if you feel something wet on your shoulder, it’s either stalactites dripping water if it’s cold, or bat guano if it’s warm. Some of the trees were tagged with signs giving their names in Spanish and Latin, the trail was wide and easy for kids and even for an older lady with a cane in our tour group. Everywhere they’ve built stairs into the cave, and the tour guide lets you know where it’s safe to go. Our guide was high energy, and we saw a couple of Puerto Rican boa snakes, who are harmless and different than boa constrictors. The highlight of the tour was a large “window” overlook, where you can see out from a height of 650 feet. And we saw petroglyphs, carvings by ancient peoples, and a tree with extremely long roots reaching more than a hundred feet into the cave interior. We also saw many birds, but bats are few after the hurricane, and will eventually return to nest. The experience took less than an hour, too short to make a special trip for, but if you’re in the area it’s fantastic. 5 stars. 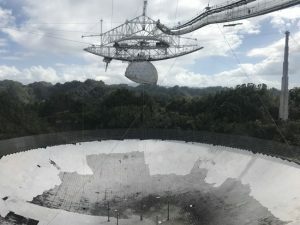 Nearby we visited Arecibo Observatory, which you may have seen in the Jodie Foster movie Contact and the James Bond film GoldenEye. It’s a giant, and I mean ginormously giant, metal dish that acts as a radio telescope, collecting radio-spectrum “light” from the stars, or transmitting it like radar to asteroids in our solar system. It’s a wonderful jolt to drive through remote mountains to suddenly happen upon a scientific installation. No wonder they wanted to use it as the lair for a James Bond villain. Carlos waited in the car for us, a lost opportunity for him to have been our personal guide, but we found knowledgeable guides in the observatory’s visitors center, a small science museum. They have a lot of kid-friendly exhibits, including one where you shoot little puffs of air to make tiny moon craters in a rotating sand tray, which is way more fun than it should be. I was so delighted I hooted. You can take a spin on a turntable and learn about center of gravity. Placards are in both English and Spanish. Despite the remote setting, they have museum-grade amenities, including pizza, hot dogs, fried foods, nice bathrooms, and a gift shop. I recently visited the Kennedy Space Center, which was wonderful and filled with huge spaceships, but these were either unused models or decommissioned. 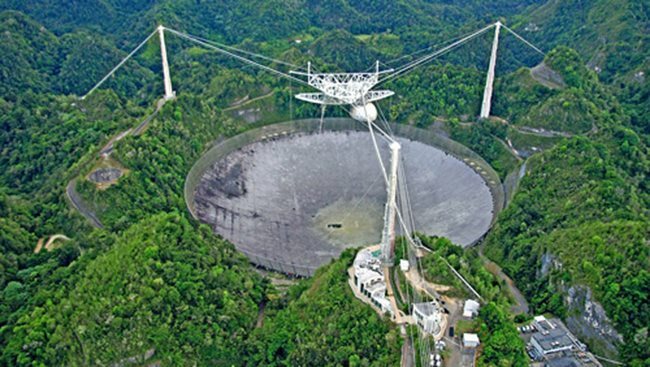 Arecibo Observatory, which is 54 years old, is still operational, and the largest radio telescope in the world. We learned a lot, but just standing in its presence is inspires awe. It’s enormous, a magnificent achievement of humankind, in striking contrast to its arboreal setting. It’s a massive thing of great beauty placed in the wild, a modern Stonehenge. It hums low, like an enormous animal, a beast, that’s biding its time. Huge and powerful, it’s a triumph of science. And comes with a helicopter pad. 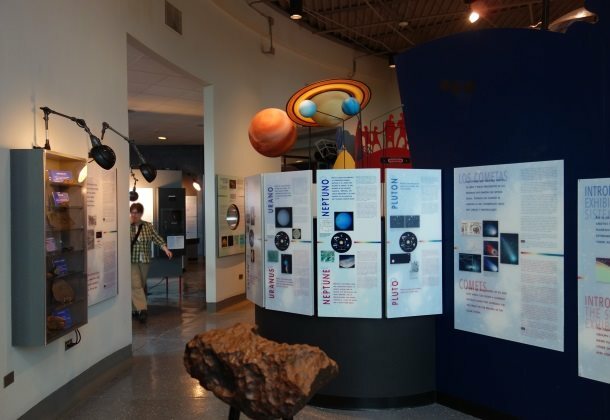 Note that Arecibo is only open 10am-3pm Wednesday to Sunday. It’s only $12 for adults and $8 for children, a bargain. Because they were closing we had only an hour there, which was not quite enough time, but two hours would have been more than enough. 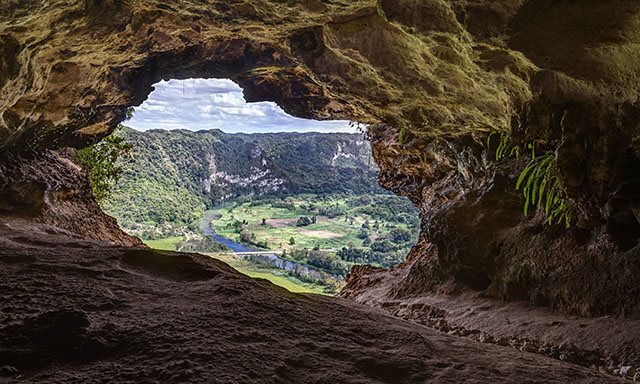 The Window Cave and Arecibo Observatory are each 5-star experiences, but since they’re short, you’ll want to combine them into a single drive. 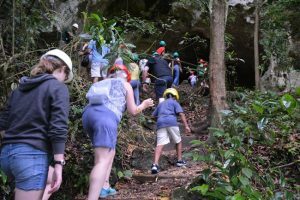 Soon when damage from the recent hurricane is repaired you’ll be able to also combine in seeing the nearby Camuy Cave and Indian Cave. Overall our Castillo Tour was also 5 stars, but we note that, Carlos did not host us and guide us so much as it was mainly a driver service.